4 classrooms and 1 class room with LCD facility. 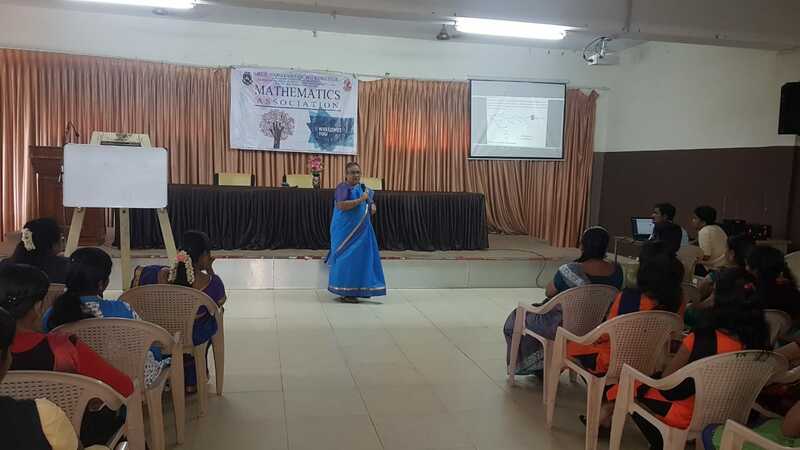 Organized Valedictory function on 05.03.2019 on the Title Applications of Differential Equations. 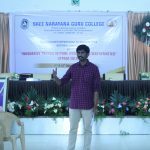 Chief guest: S. Nareshkumar Head & Associate Professor, Department of Mathematics, Sri Krishna Adithya College of Arts and Science, Kovaipudur, Coimbatore. Conducted a Magic Show on 28.02.2019. Conducted Food fest- Quick Buck on 28.02.2019. 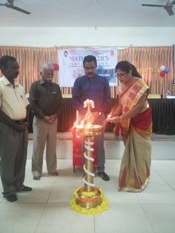 Organized National Seminar on “Innovative Trends in Pure and Applied Mathematics” on 11-02-2019 and 12-02-2019. Venue: Vivekananda Hall. 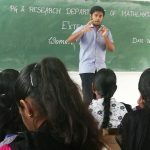 Dr. C. R. Jayanarayanan, Assistant Professor, Department of Mathematics, IIT Palakkad, Kerala. Topic: Diagonalization of Matrices. 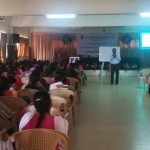 Dr. V. B. Kiran Kumar, Assistant Professor, Department of Mathematics, Cochin University of Science and Technology (CUSAT), Kerala. Topic: Matrix Representation of Operators on Vector Spaces. 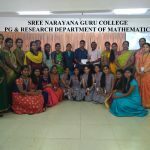 Dr. Gnanambal Ilango, Assistant Professor, Department of Mathematics, Govt. Arts College, Coimbatore. Topic: Intuitionistic Topology. 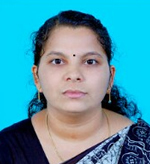 Dr. K. Balachandran, Professor (UGC-BSR), Department of Mathematics, Bharathiar University, Tamilnadu. Topic: Recent Trends in Theory and Applications of Differential Equations. Organized a State level Workshop on Latex on 18.12.2018. 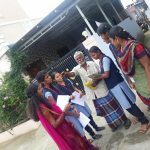 Chief guest- Dr. M. Mallikaarjunan Assistant Professor, Department of Mathematics, CBM College, Kovai pudur. 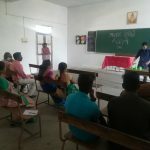 Conducted an Intra Departmental Competition Maths Cultural Fest on 05.10.2018. Conducted an Intra department competition Extempore on 27.09.2018 on the Title What you like in your parent’s generation and what you don’t like. Organized a Paper presentation by M.Phil Students in the Research Forum on 19.09.2018. 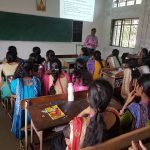 Organized an Extension activity on Awareness on Distance education on 10.08.2018. 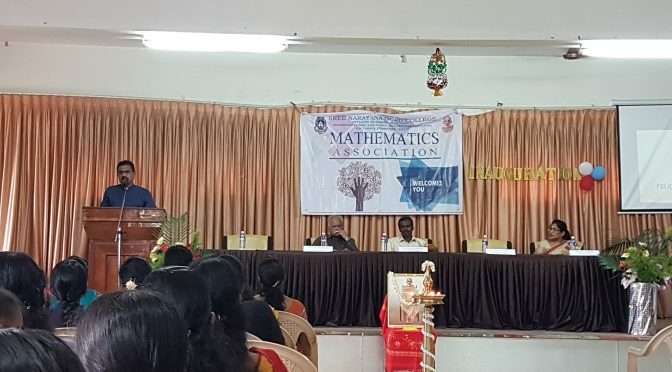 Inaugural function of Mathematics Association on 03.08.2018. 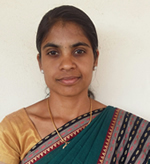 Resource Person: Dr. S. Narayanamoorthy, Assistant Professor, Department of Mathematics, Bharathiar university, Coimbatore. Organized an Intra Department Competition- Extempore, Title- Women’s Safety on 26.07.2018. Organized Seminar on “Operations Research and Real Life” on 20-07-2018, 10AM. 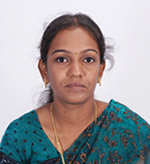 Resource Person: Dr. F. Hannah Revathy, Dean, School of Science &Humanities, Sri Ramakrishna College of Arts and Science, Coimbatore. Conducted an Orientation Programme on Awareness on CSIR NET on 03.07.2018. 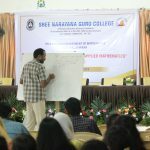 Chief Guest: Sankar, Librarian, SNGC. 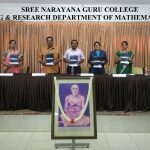 The Valedictory function of Mathematics Association was conducted by the PG & Research Department of Mathematics on 13.03.2018. 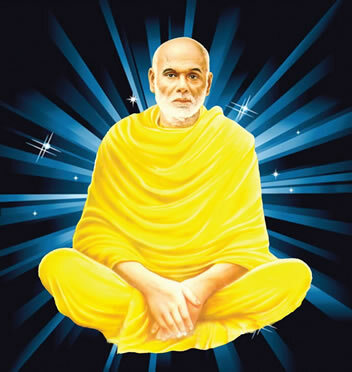 Dr. T. R. Krishnan Vice Chairman, Sree Narayana Guru Educational Trust, presided over the function. 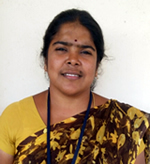 Dr. S. Kiruthika (Sr.Gr. 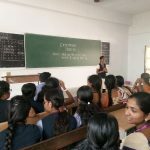 ), Assistant Professor, Amrita School of Engineering, Amrita Vishwa Vidyapeetham, Coimbatore delivered the valedictory address. 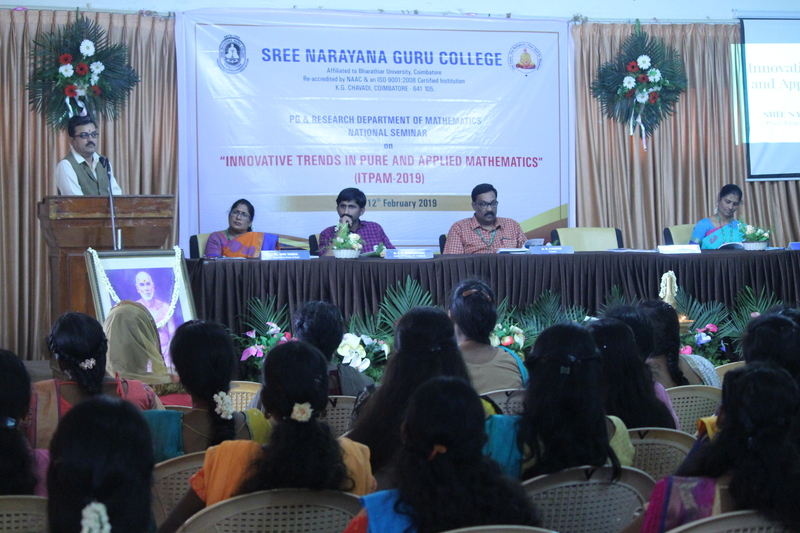 Dr. K. V. Surendran Principal, Sree Narayana Guru College felicitated the function. Ms. Renu Thomas, HoD of Mathematics presented the Annual Report. 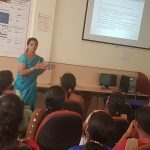 An Orientation programme on “Blog Creation” was held on 28.06.2017 for the final year students. A Seminar on “Continuous Function in Metric Spaces” was held on 12.07.2017. 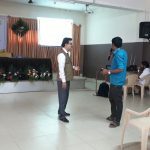 Dr M S Mutharasu, Asst. 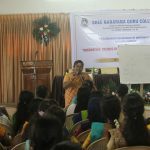 Prof., CBM College, was the resource person. 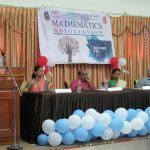 Mathematics Association – 16 was inaugurated on 28/07/2016. Research Forum conducted paper presentations on 29/07/2016 & 30/01/2017. Inter department Fest (QUICK BUCK’16) was conducted on 19/08/2016. Donation to Cochin Cancer Society was done by conducting a FOOD FEST on 19/08/2016. Seminars were conducted on 20/09/2016 & 06/03/2017. Intra Cultural Fest’17 was newly initiated & conducted on 16/02/2017. The Association Activities concluded with the Valedictory Function on 14/03/2017. Students: 5 students were awarded with M.Phil. Degree during 2016-17.